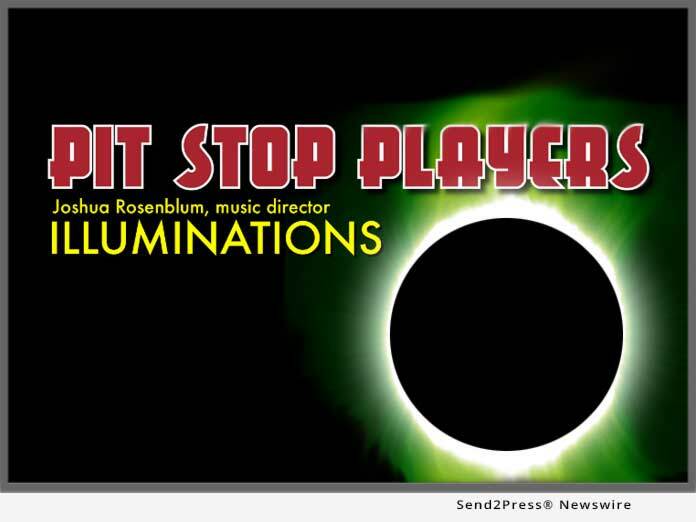 NEW YORK, N.Y., Mar 27, 2019 (SEND2PRESS NEWSWIRE) -- The Pit Stop Players, the genre-defying instrumental chamber group composed of veteran Broadway pit musicians, will shed light on three new works at the DiMenna Center for Classical Music's Cary Hall, 450 West 37th Street, on Monday, May 13, 2019 at 7:30 p.m. Headlining the program is the American premiere of Kevin Lau's "Illumination," a Double Concerto for Piano, Percussion, and Strings, featuring brothers Garah Landes (piano) and Greg Landes (percussion), known collectively as the duo Synchronicity. "Illumination" is one of a very small number of works in the concerto genre that features piano and, in this case, fifteen different percussion instruments. "It's going to be electrifying," says Pit Stop founder and music director Joshua Rosenblum. "It's a unique layout, with the piano and all that percussion out front, and these two virtuoso performers-who also happen to be brothers-going wild with all the gear accompanied by a string orchestra. We've never done anything like this before, and I'm certain our audience has never seen anything like this before!" The third movement of "Illumination" is titled "Einstein's Dreams," and was inspired by Alan Lightman's bestselling novel of the same name. By coincidence, Rosenblum, also inspired by Lightman's novel, has adapted "Einstein's Dreams" as a musical theater piece. Prospect Theater Company will present the musical's Off-Broadway debut this fall at 59E59 Theaters. To complement Lau's piece, Rosenblum created a concert suite from his "Einstein's Dreams," incorporating themes from his musical. The concert will open with the world premiere of legendary Broadway orchestrator Jonathan Tunick's "Serenade for Strings." "I'm honored to be able to present Jonathan's wonderful composition," Rosenblum said. "He's a living legend as an orchestrator, and hearing his original music will be another kind of illumination." The concert also includes a suite of movements from various pieces thematically connected by the concept of Time: Olivier Messiaen's "Quartet for the End of Time," Robert Rodriguez's "Musica por un tiempo" (which was directly inspired by the Messiaen piece), and Robert Muczynski's "Time Pieces" for clarinet and piano. Stravinsky's neoclassical masterpiece, "Concerto in D for String Orchestra" concludes the program. Cited by "The New York Times" for their "flair," "spirited readings," and "playfully cohesive programs," "making an hour-long serving of modern works not just palatable but enticing," the Pit Stop Players remain at the cutting edge of New York's cultural landscape, bringing exciting contemporary music to new audiences, and upending conventional assumptions about concert programming. Founded in 2009 by conductor/composer Joshua Rosenblum, the ensemble is comprised of some of New York's top freelance musicians, commonly regarded as the best instrumentalists in the world. Repertoire includes arrangements and transcriptions of great pieces from the recent past (encompassing numerous genres), as well as undeservedly neglected classical gems, but the primary emphasis is on new compositions that are both challenging and immediately engaging, written and orchestrated specifically for the group by today's most exciting creative talents. Highlights have included the group's performance of "The Rite of Spring" in a specially-commissioned new chamber arrangement, as well as Rosenblum's own "Young Person's Guide to the Pit Stop Players," with guest narrator Cynthia Nixon. In 2016, the Players gave a joint performance with the Brooklyn-based dance company The Chase Brock Experience, a collaboration which zealnyc.com described as "perfecting perfection."